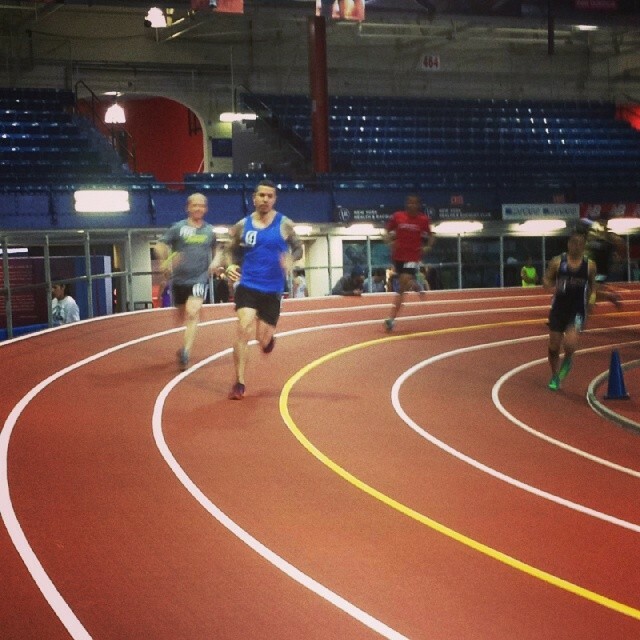 NYRR hosts track meets during the winter months here in NYC. I went up to run with the Team (Gotham City Runners) this past Thursday, fearing for my life as I haven’t done track work since… oh maybe September? We had a great turnout, especially since it was so cold it was actually chilly in the Armory, something I have never experienced. It’s normally steamy hot in there, and kinda stinky. I signed up for the 800 M and the 1 Mile Relay with my friend Doug as partner. It was a long night, but very fun. Generally speaking there were 8-9 heats per men’s race and 4 heats per women’s race so there was a lot to watch! Gotham City Runners were doing great! Lesley, Lauren, Alina, Kate, Alexandra, and Maura were holdin it down! In the men’s races we had Josh, Daniel, Stark, Doug and myself puttin down some speed as well. While watching everyone race I spent time taking pics and hanging with Lily and Dexter. Everyone kept telling me that the air was dry and wonky in the Armory. 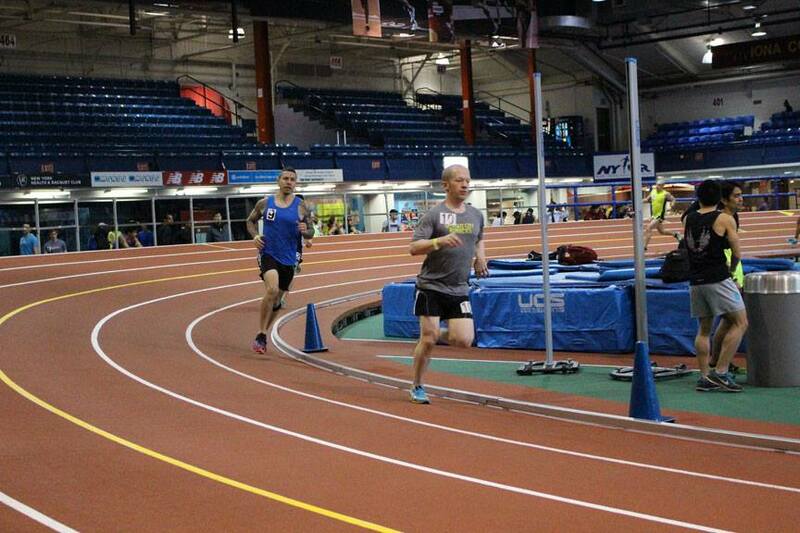 I didn’t know what they were talking about until I hit my 800 M. Doug and I set it off taking the lead. I felt great on lap 1 and 2, then I started fading. The fade wasn’t leg pain, it was my lungs in blistering pain. Doug took lead and I just hung on. As we rounded lap 4 some guy came outta nowhere running Mach 2 and blasted past me! There was nothing I could do, but Doug held onto 1st Place. Nice. As partners on the 1 Mile Mens’ Relay we decided to break it up into 400s. Doug set it off pretty hard. After the hand off I blasted into the circuit following a Front Runner pretty tight. Doug’s second lap was fast but he looked like he was in pain and therefore I was about to experience said pain. I grabbed the baton and my legs were like ‘Whaaaaaaaa…t?’ I tried to maintain some semblance of pace but I may have looked like a baby giraffe just learning to walk. We finished in 04:46.88. After the show we hit Coogan’s (of course, that’s what you do when at the Armory) and had a few celebratory brews.